I received an review copy of this book from New Vessel Press. This book was originally written and published in German in 2012. The English version has been translated by Shelia Dickie. Hikikomori is the Japanese term for youths who shut themselves into a room in their parent’s home and have very little contact with their family. According to Flasar, these young people may lock themselves away from society for up to fifteen years because they are overwhelmed by the expectations to conform and achieve in school and in their careers. Since being a hikikomori is an embarrassment to a family, no one knows the exact number of them that exist. Flasar captures the loneliness, isolation and sadness that is felt by a hikikomori through the character of Taguchi Hiro in I CALLED HIM NECKTIE. Taguchi has not come out of his bedroom in his parent’s home for two years and he even eats the meals that his mother leaves at his door in isolation. One day Taguchi remembers the pleasantness of childhood when his mother would bring him to the park, so he ventures outdoors and sits in the same park. He has waves of anxiety and nausea as he is trying to fight through his agoraphobia and the one thing that calms him down is a man who, dressed in a suit and tie, sits on a bench near him and meticulously eats the lunch from his bento box. Taguchi and the man he calls “Necktie” show up at the park every weekday and eventually they strike up a conversation. Taguchi’s family, neighbors, and teachers at school all put a tremendous amount of pressure on him to succeed and to fit in. His conformity leads to what he believes are tragic consequences that involve two of his fellow classmates. When the pressure to conform becomes too much, he closes himself off from his family, declares, “I can no longer” and he does not speak for two years. The first person to whom Taguchi speaks after those two years is “Necktie” from the park and once Taguchi starts talking he does not stop. “Necktie,” whose real name is Ohara Tetsu, comes to the park everyday because he has lost his job and cannot bring himself to admit this fact to his wife. He adheres to his normal routine of waking up everyday at 6 a.m., dressing for work, taking the bento box that his wife has prepared, and riding the commuter train. Ohara is the result of what happens to the youth in society who do conform: he is tired and worn out and thoroughly embarrassed when his career is taken away. Ohara and Taguchi spend hours confiding in each other and through their conversation we learn of their struggles, heartaches, losses and phobias. They both needed human interaction and human contact and fate brought them together at just the right time. It is worth noting that they rarely have a dialogue in the book. Either one of them is talking at length or the other. They each longed for someone to truly listen without judgment and that is the gift that they give to one another. The writing of the book is terse and curt with no quotations marks. This is fitting for Taguchi and Ohara as their stories spill out from their mouths, sometimes in fragments and sometimes in philosophical reflections; it seems as though they are desperate to share their lives with each other and make a connection as urgently as possible. I CALLED HIM NECKTIE is an uplifting story about two people who feel isolated and abandoned by their society but find comfort in the attentive ear of one another. I highly recommend this short, yet inspiring tale. 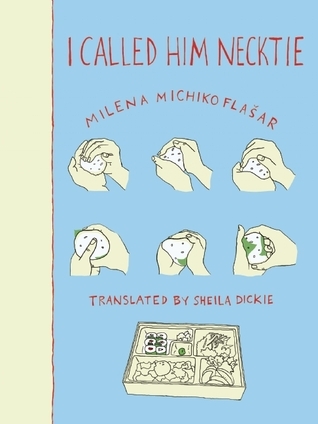 Milena Michiko Flašar (St. Pölten, 1980) studied comparative literature, Germanic and Roman languages at the University of Vienna, and taught German to non-native speakers. 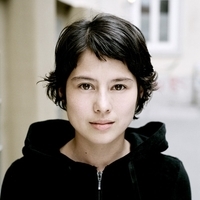 After several successful publications in a variety of literary magazines, she made her debut in 2008 with the collection Ich bin (I am). This volume includes three short stories about love and parting. The short story Okaasan – Meine unbekannte Mutter (Okaasan – My unfamiliar Mother) appeared in 2010, telling the story of her dying demented mother. She has received several prizes and scholarships for her work. Meanwhile she has started writing full-time. In feburary 2012 her new book Ich nannte ihn Krawatte was published. This sounds like a brilliant story, both for the psychological and cultural insights it offers and for the pure form of its structure, the conversation on the park bench. Great find! After reading your review, I want to read this! It’s a great book and a very quick read. It’s only about 130 pages. Echoing what others said! I’ve never heard of this one but would definitely check it out if I come across it at the library. Ohara’s story sounds particularly heartbreaking. Thanks for sharing!